This serene extension of Sanur holds total relaxation beneath the shade of coconut trees and the wild calls of the tropical forest. With endless blue skies, beautiful beaches and fascinating cultural heritage, Gianyar is the place to visit to get the best of your trip to Bali. Welcome to the "real" Bali. Temples, markets and traditional crafts. You can often have one of the grey/black sand beaches for yourself. A great place to explore traditional Balinese food. Try the Gianyar Babi Guling. If you are lucky you might find someone local to share a beer or two. Good beaches, Bali Safari and Marine park and lots to see. Spas and massages are hard to find, unless you live in a villa with spa. Luckily Ubud is nearby. White water rafting on Ayung river and horseback riding on the beach. About half and hours drive to Padangbai. Secret and Keramas beach are world class surf spots. Nearby you can find the Bali Safari and Marine Park offering an extensive collection of wildlife; you can cuddle baby tigers, ride an elephant and immerse yourself in the wilderness. Gianyar is one of the best preserved towns in the whole of Bali, here you can never be bored – discover the secrets of Elephant Cave, the excitement of Monkey Forest in nearby Ubud and the exquisite palaces. Close to Gianyar you find beaches with glistening black sands, often deserted, with gentle breezes rolling in from the Indian Ocean. Saba Beach is only a short distance and offers complete seclusion and solitude from the crowds. With only the odd local fisherman for company you can experience a desert island getaway. Saba beach even offers horseback riding across the rich volcanic sands, feel the thrill of riding in this dazzling setting to the sound of thundering waves. Gianyar is alive with the sweet smells and lively sounds of bright and beautiful flea markets. You can explore the stalls and find special treasures at Sukawati Art Market. Pick up traditional paintings, woodcarvings, jewelry and clothes. Indulge in the hustle and the bustle of the market scene, haggle like locals and stock up on some of Bails best crafts. After dark you can head out to the Bali Theatre and observe a breathtaking performance of song and dance. With bright lights, plenty of color and even live animals integrated into the show the Bali Theater is a spectacle not to be missed. 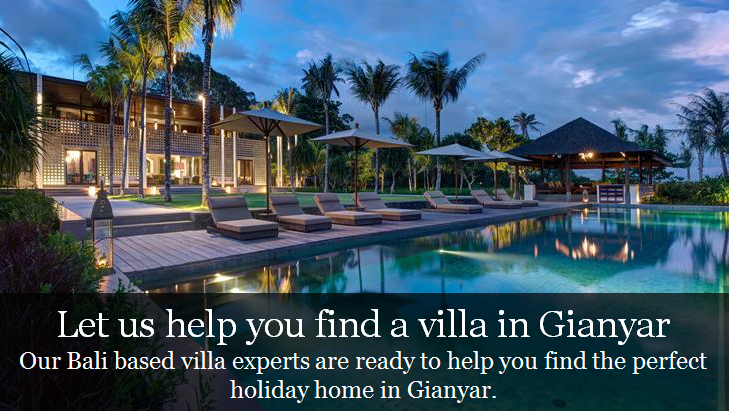 Gianyar is for those who want more from their Bali experience than simply lying on the beach. To see the real side of Indonesia, immerse yourself in the sights and sounds of the wild, discover local heritage and sample the delights of Gianyar.